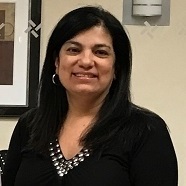 Kim DeMarzio is the Operations Manager with Biagini Grassi Advisory Group LLC. She specializes in all areas of small business management and has an extensive background in customer service. A self-proclaimed “people person,” she cares deeply about the firm’s clients and assists them with their needs. Kim also owns a pizzeria with her husband, which has helped her hone her customer service and small business management skills. A New York native, she enjoys traveling and spending time with her husband, Bobby, and her proudest accomplishment - twin boys, Robbie and Joe.